So, you’ve had your Nexus 7 for awhile (…or you’ve picked up one just recently after the ridiculous price drop) and are wondering how you can put a little oomph back into the device. Look no further, here’s a list of a few things you can do to your Nexus 7 in order to make it awesome again. Okay, this one is specifically for the Nexus 7 2013 edition, but it’s a pretty big one that I wasn’t truly aware of until I started looking into it. The new Nexus 7 comes with Qi wireless charging built into the device. As such, you just need to buy a compatible Qi charging station and you’re good to go. You can go the official route with the Nexus Wireless Charger or go the third-party route. If you haven’t already done so, this is the first step in order to root / install custom ROMs on your Nexus 7. Thankfully, with the open nature of the Nexus line of devices, this is a much simpler process than with other devices. By unlocking the bootloader, you can install unsigned code (custom ROMs) and root the device. First, you’ll need to download the Android SDK from Google and install it on your computer. This will give you the necessary tools for your PC/Mac to perform the unlock. Make sure your USB debugging is turned on in the Developer Settings. If you don’t have Developer Settings enabled yet, go into the About section and select your Build Number about 8 times. Then, you can follow this quick and easy tutorial, at least the first part, in order to unlock your bootloader. If it’s available in your region, it’s an easy setup to get Chromecast going and start streaming your videos/music to your TV from your smartphone, PC, or even your Nexus 7. Setup it super easy: plug Chromecast into your television, connect to your WiFi network, and away you go! Support for Chromecast is slowly gaining traction, but you have access to some big services right off the bat including: Netflix, YouTube, Hulu, Pandroa, Google Play Movies and more. Got a little bit of jealousy over people who have the Galaxy Note 2/3 and are using an S Pen with their device? You can easily emulate at least some the features, as well as using a physical stylus, with your Nexus 7. With a compatible stylus, such as the iWalk Amphibian, you can combine a touch of modern and classic technology into one device: one end is a capacitive rubber tip that allows use with a touch screen tablet. On the other end is a ballpoint pen for taking notes on paper. Are you stuck with still tapping away on the keyboard trying to get used to a non-physical keyboard? Have you tried out the swiping method? Not only are there a ton of keyboards available for download on the Google Play Store that emulate this feature quite well, but as of Android 4.2, it is built into the Android OS. All you have to do is to start swiping a line through all the letters in the word you want to type and Android will offer predictive suggestions and auto-finish the word for you. While it’s not for everyone, it’s definitely worth giving it a try. The learning curve is very minimal and after using it for just a few days, I already notice an increase in speed when writing on my Nexus 7. Another note: you can add your own personal dictionary/words through the Language and Input settings. This way you can manually add in words that you may use often and that aren’t in the default dictionary. As someone who writes in a few languages while using the tablet, it’s a quick and easy way to get the correct words without having to change the default system language. Those are some things that you can do to make your Nexus 7 awesome again. Please feel free to share some of your tips in the comments! When I travel I use my Nexus 7 with a logitech keyboard. 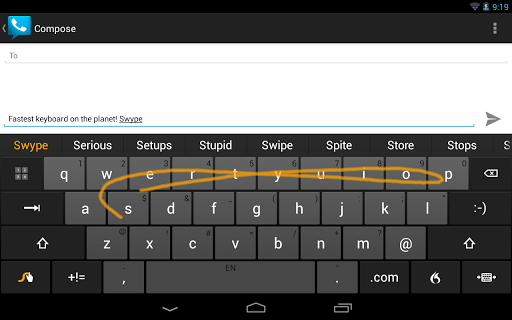 Otherwise I use the swype keyboard. Either way, my Nexus 7 is the best Xmas present I have gotten in a long, long, time. 'high-speed typing'. 'Brushes' have mixed results, since they only 'paint' at one spot. Also, find a good cover. I like 'Moko', over the Poetic. (I have both). And I got a microUSB to USB-F adapter, for less than $2, through Amazon. The swipe keyboard is good, but if you hookup a Bluetooth keyboard and mouse you can use the new Nexus 7 like a desktop. I recommend Logitech peripherals. There may be occasional crashes where the Bluetooth stops but it will usually start back up on its own. CyanogenMod is a good addition, too.